Immigration Lawyer Bronx: The History Of Asylum In The U.S. The History Of Asylum: Seeking Refuge In The U.S. The U.S. has been built on a steady history of immigrants seeking a better life. Whether the reason was to get a better education, seek out employment opportunities, or experience freedom from persecution, America has centuries of history in which we have taken in those who left their home country for a better life. During today’s political climate, however, it likely feels as if we have slammed our borders closed to all comers, no matter where they come from. In the past, immigrating to the U.S. largely involved just physically arriving in the country. Before Ellis Island opened in the late 1800s, immigration was left up to each state individually. There were no set standards or processes to follow. Around the time that Ellis Island opened, immigration started becoming more structured. Part of it was that Ellis Island was a federal immigration station, not just one for the state of New York. In addition, national legislation started placing restrictions on who could immigrate, and how many immigrants would be allowed entry in a given year. After World War I and the Great Depression, there were concerns over resources as well as what immigrants could potentially bring to the country, in terms of benefits. Immigration quotas were established, limiting immigration to two percent of each nationality’s population in America. Since a majority of immigrants around that time were European, this opened up immigration for Western European nations, but effectively limited immigration from Asian countries. At the same time, literacy tests were also instituted for immigrants over 16, a measure which further affected immigration from less-established/Western nations. Other than those basic restricting measures, there weren’t many other regulations surrounding immigration to the U.S. It wasn’t until World War II and the aftermath that the government became increasingly concerned with where immigrants were coming from and why. The often-shared story representing the start of asylum measures is that of a boat full of Jewish refugees approaching the U.S. in search of safety from persecution in Nazi-occupied Germany. When they reached the U.S., they were denied entry and the boat was sent back to where it came from. The passengers on the ship didn’t have anywhere safe to turn, and many were sent to concentration camps, where they died. This event compelled new legislature after an assessment of conscience. Refugee status became an important distinction. In order to help guard against further tragedies like the one described above, immigrants could claim refugee status, which allowed them to immigrate with certain protections. It didn’t necessarily help someone bypass immigration restrictions, but it created an alternative for those who needed help leaving their home nation expediently. The last may sound like a broad, hazily-defined category, but it is used in modern times to describe those who are persecuted on the basis of gender, sexual orientation, and similar statuses. Prosecution based on social group can also extend to those who are connected to an identifiable group they don’t want to associate with or have trouble escaping. This could include those trying to escape gang associations, those being forced into military service, or even unsafe family life. The overarching connection between all five categories is that refugees and asylees are people who need help leaving their home nation, or who have left their home nation, and cannot safely return. In the years after World War II and the Cold War, legislation was put in place to help refugees leave dangerous situations. Those changes also affected U.S. immigration as a whole, since the changes did away with the immigration quotas that started during the 1920s. In fact, since World War II, the U.S. has accepted more refugees than any other nation, and have admitted more than 2 million refugees since 1980. After World War II, legislation also expanded options for asylees coming to the U.S. If an immigrant is still in their home nation, they can apply for refugee status. But if an immigrant has already left their home country and can’t return, they can apply for asylum. To do this, they will need to declare asylum at any U.S. port of entry (including border entries, airports, and so on). However, immigrants already in the U.S., even those in the country unlawfully, can still apply for asylum. They can either proactively apply for asylum once entering the country, or they can claim asylum during deportation proceedings. Applying for asylum or refugee status can be a lengthy, multi-year process just like the green card and naturalization processes. In order to help that process go as smoothly as possible, it’s important to find knowledgeable guidance. If you or a loved one is applying for refugee status or for asylum, get help throughout the process from an immigration lawyer. For those already in the U.S. seeking asylum, working with an immigration lawyer can be especially important because, if the application for asylum is denied, that can start deportation proceedings. Make sure the application is as thorough as possible to improve the chances of approval. 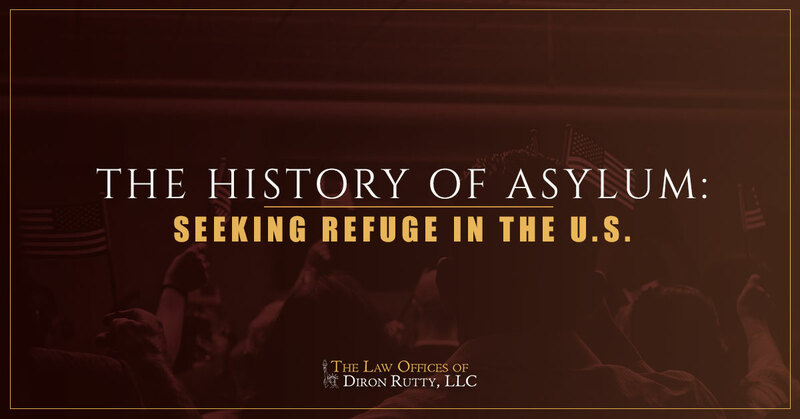 To speak with an experienced immigration lawyer in the Bronx and across New York City, contact the Law Offices of Diron Rutty, LLC today.